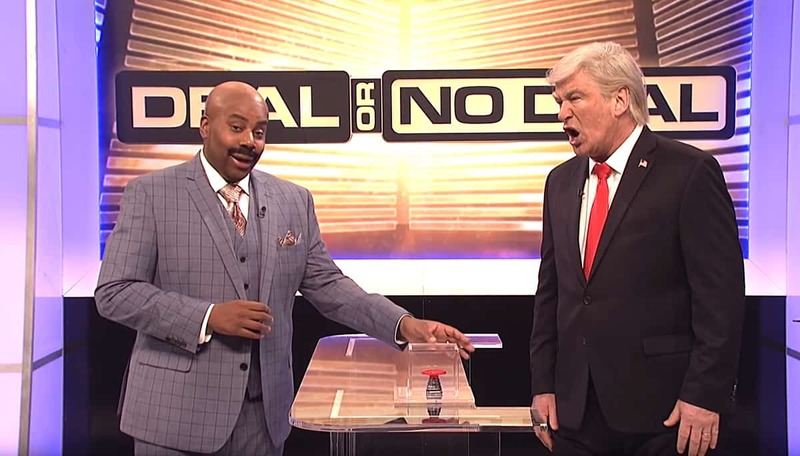 Saturday Night Live returned and immediately tackled the government shutdown with a game of ‘Deal or No Deal: Shutdown Edition’ between Alec Baldwin’s Trump and Kate McKinnon’s Nancy Pelosi. Thompson’s Harvey then revealed a panel of members of Congress holding numbered briefcases. “You want to open briefcase number 5?” asked Thompson’s Harvey. Spat Baldwin’s Trump: “I can’t do the State of the Union? Then guess what? You’re not flying to Afghanistan. Trump later went to “older Jewish woman” Chuck Schumer, to Mitch McConnell hiding behind his briefcase, “very low IQ person” Maxine Waters, Alexandria Ocasio-Cortez, Cory Booker, Steve King, Cardi B, and a Clemson football player.